Dan Schwartz is always smiling. Schwartz, the guitarist for Good Old War, is a considerate fellow and appreciative of what he has. With plenty to smile about, Good Old War has recently released their debut album and finished their first tour. 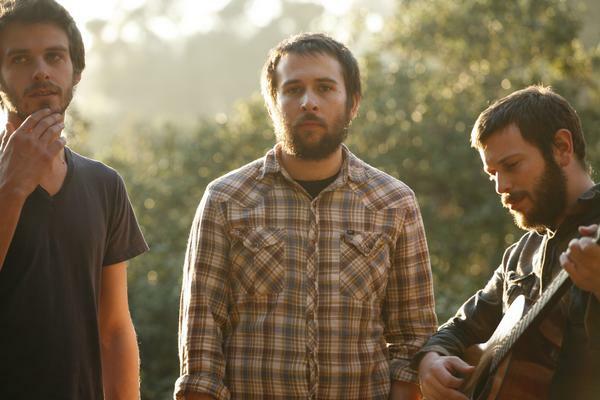 GOW has derived from the band Days Away, and was touring with Person L and Anthony Green. They took the stage at the Orpheum on September 2nd. I think they’ll be back soon. It’s almost to the end of tour- how have the road and crowds been treating you? Pretty amazing. It’s been an incredible tour because we’ve have had actual fans in every city. That’s pretty amazing because it’s our first tour, so we’re pretty excited. Has there been a best or most memorable show? I wouldn’t say there’s been a best because they’ve all been really good, but the most memorable I would have to say Chain Reaction in Anaheim for two nights. They were the craziest, hottest shows, ever. The hotter it gets the more insane people seem to go. Also, we’re not a loud band. So, it was exciting to see the people get that revved up over just the actual music, it’s obviously not because we’re some crazy punk band or something. I noticed that a few years back during the Days Away days you guys toured with the Starting Line- and now you’re touring with Person L- which sort of came from Starting Line. How have these tours come about together? Did they have something to do with We the people Records and/or both of you being from Pennsylvania? Randomly. Really one of the coolest things about this tour is at least most of the band members have been friends for a really long time. Anthony has been friends with Kenny- we’ve been friends with Kenny- we’ve been friends separately and together. I think it made sense since he was taking us out- we were his band- to have another friends’ band come along too, so there was nobody left out. I think it’s just the fact that we’re all friends – and the fact that Anthony really dug on Kenny’s new band. Person L is an awesome band. It’s really different from Starting Line- it was a high school poppy sound before- and now it’s not..
Well, he’s grown up and he’s taken control, I think in a lot of ways. And I think he’s had the taste of success that you can have with a band that’s playing something more mainstream- and I think he’s realized what’s important to him. And this is just my idea- this is a chance to do something really creative and exactly what he wants to do without any pressure yet, because I think eventually bands start getting pressure from labels. He doesn’t have to have that kind of pressure. I read on Starting Line’s Wikipedia page that Geffen, their old label wanted more radio friendly songs- which was ridiculous. Label issues are horrible; especially for a young band. They were all 18, 19 when they were signed to a major label. I can’t even imagine what that would be like. I mean, they were kids. Kids don’t really know how to assert themselves in the same way that you start to when you get older- even now- on smaller labels you’ll find yourself agreeing to stuff you might not think are exactly right just to be agreeable. I can’t even imagine once pressure starts getting put on your when you’re a kid. That’s gotta be hard. Have you guys always been on smaller labels? Days Away was on a pretty big label called Lava, which was sucked up by Atlantic. So, that was pretty huge but then they got moved and downsized to Fueled by Ramen and Fueled by Ramen basically forgot that they were there. They didn’t fit on that label in the first place, probably. I mean- for us, we’ve only been on one label and that’s been Sergeant House. And that’s been the best thing ever. It’s based out of L.A. It’s cool as hell. Super cool- and they actually love their bands. And there are amazing bands on that label. Are there any issues that you feel strongly about that have made their way into your music and song-writing? We tend to write about things that are happening with us. Keith and I split the song-writing. We tend to write for each other or we’ll write for ourselves, but we haven’t written a whole lot that isn’t- well, I’ve started to say a few political things, but I’m scared to get into that realm because I don’t want to have to answer- you know, for one, things change and I don’t want to have to answer to that whole political side of things. I’d rather just sort of write things from the heart and if something does come out then I can just say well that’s the way I felt at that moment. And we really only write when we’re in certain moods. I think that’s the way most writers do it. That mood is usually what inspires the song so, that’s what the song ends up being about. Was it a conscious decision to switch from having a more indie rock sound to having a more acoustic and folk sound? Yeah, it wasn’t supposed to necessarily be another band really, but the way we got started was when Days Away was already on Sergeant House, the label asked if they could do an acoustic version of one of their songs. That was sort of my specialty and we had been friends for a long time, so we did an acoustic version of a Days Away song called God and Mars and it came out awesome. So, we started doing more stuff together- we would do new songs and other cover songs. Keith and I had kept singing together and playing acoustic stuff, so when Days Away broke up it naturally just became another band. It was supposed to be acoustic from very, very beginning, but not meant to be another band. What got you to pick up an instrument or start singing? I had some cool parents. I started when I was real young. I think we were all like that. All of our parents played music and played the instruments that we did. Keith’s dad is a singer and a guitar player. It’s not what he does, but he plays, and my dad is a singer and guitar player and Tim’s dad is a drummer. I grew up listening to the Beatles, Leonard Cohen, Simon and Garfunkel; stuff that probably still influences our band. What would you say is the best and worst thing about being a musician? Best is getting to hang out with your friends all the time, become a family and get closer with people in a way that I don’t think anybody ever could understand. You get to get close to the people in your band in a totally different way- which could probably be the best and worst thing right there. But, the experience you have with singing and blending and connecting with people- that’s beyond words. The worst is missing your family, friends and life at home. At the same time touring is one of the best things up there, too. I wouldn’t rather do anything else, but you do miss your family. Are you guys originally from Pennsylvania? How’s the scene? Yup- we’re all from there and grew up there. The scene is okay. I’d say Langhorne- Keith and Tim are from that suburb, that a lot of great bands came from there. Philadelphia is pretty good- I’d say there are amazing bands and amazing venues, but not the best crowds. People don’t support local bands until they’ve already made it somewhere else and then they claim them. There are amazing bands like Dr. Dog, one of my favorite bands ever, from Philly- and The Teeth and Man Man also from Philly. They’re all so awesome but nobody claimed them as Philly bands until they started to already make it and now they’re getting really big. It’s a bit of shame and I’m unimpressed about that. What do you think you’d be doing if you weren’t playing music? Are there any questions that you don’t like being asked?